DENVER, Colorado, February 15, 2012 (ENS) – The U.S. Forest Service regional office in Denver has overturned approval of a coal mine expansion next to the West Elk Wilderness that conservationists say would destroy forest habitat for elk, lynx, black bear and other wildlife. The decision came in response to an appeal filed by conservation groups late last year. The appeal was filed by the nonprofit law firm Earthjustice on behalf of the Sierra Club, High Country Citizens’ Alliance, WildEarth Guardians, and Defenders of Wildlife. The 1,700-acre mine expansion in the Grand Mesa, Uncompahgre, and Gunnison National Forest would have set the stage for Arch Coal company to build as many as 48 well pads and 6.5 miles of road into pristine roadless lands dotted with clear lakes and ponds, aspen stands, and beaver lodges. In addition, the decision would have resulted in continued uncontrolled methane pollution from Arch’s West Elk coal mine, one of the state’s single largest carbon emitters. St. Louis-based Arch Coal is the nation’s second largest coal producer. On Tuesday, the Forest Service decided that the GMUG National Forest failed to explain why it had weakened protections for lynx and bald eagles, and also weakened measures meant to prevent landslides. That failure violated the National Environmental Policy Act, the regional office concluded, and required vacating the approval. Almost all of the proposed mine expansion is within the Sunset Roadless Area, a pristine landscape of beaver ponds and aspen and conifer forests that provides habitat for lynx, elk, and black bear adjacent to the scenic West Elk Wilderness Area. The conservationists warn that mine expansion would turn the roadless area into an industrial zone of well pads and roads, with an average of 18 wells pads and two miles of road per square mile. The mine expansion was approved days after a decision by the Denver-based Tenth Circuit Court of Appeals upholding the 2001 National Roadless Rule, court action in which the Obama administration defended that rule. The National Roadless Rule prohibits road construction on about four million acres of roadless forest in Colorado, including the Sunset Roadless Area that Arch Coal had planned to develop. Although the West Elk coal mine is underground, safe coal mining in the North Fork Valley requires that methane venting wells be drilled above the mine. The West Elk mine spews millions of cubic feet of methane pollution every day. Methane is a potent greenhouse gas with 21 times more heat-trapping ability than carbon dioxide. 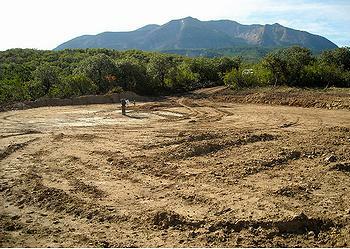 Methane venting makes the West Elk coal mine one of the single largest carbon polluters in Colorado.